Coltraco Ultrasonics are proud to have signed the Women in Maritime Pledge: "We are committed to building an employment culture that actively supports and celebrates gender diversity, at all levels, throughout our organisation, and our industry". This comes as the ITF estimates that women make up only 2% of the world’s maritime workforce. Coltraco are proud to support gender parity and equal pay. 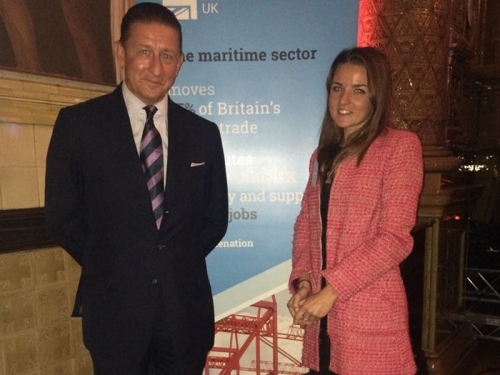 Carl Hunter, CEO and Clare Hunter, Head of Marketing & Communications were delighted to attend the Women in Maritime Charter Launch, as one of just 60 companies who have signed the pledge. In a video created by the Dept for Transport (DfT) for this occasion our Marketing & Communications Assistant proudly describes her “fulfilling” career in the maritime industry. Coltraco hope that this is the start of positive change within the maritime sector. Coltraco hope that the UK will lead the world in changing the gender balance to create equal opportunities for all. With thanks to MaritimeUK who have been the wind in the sail of this Charter, supported by DfT, Department for International Trade, leading associations like SMI and ABP and fellow industry leaders.